‘Dag’ was born and grew up in Addis Ababa. He left his country after the 2005 post-election unrest in which hundreds of young people were killed and put in jail. After a long journey across the Libyan desert and the Mediterranean, he came ashore on the island of Lampedusa on 30 July 2006. 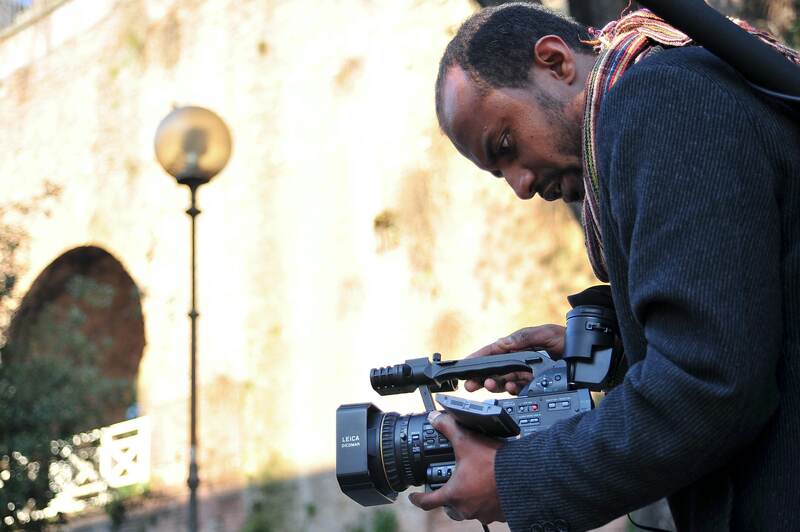 In Rome, after having participated in a video-making workshop in 2007, he co-authored the film Il deserto e il mare (The desert and the sea) along with 5 other migrants. Subsequently he was co-director with Andrea Segre and Riccardo Biadene for the 2008 documentary film Come un uomo sulla terra (Like a man on earth). He shot the documentary C.A.R.A. ITALIA (Dear Italy) in 2009 and Soltanto il mare (Nothing but the sea) in 2011, along with several other short films. In 2011 he coordinated the collective film project Benvenuti in Italia (Welcome to Italy), and directed one of the five episodes. He has been living in Verona for the last couple of years with Chiara and their daughter Ester.